The price of natural gas. The Henry Hub is a major hub of trade between different natural gas pipelines located in Louisiana. The price of Henry Hub is used as reference for the price of natural gas in North America by the contracts of NYMEX (New York Mercantile Exchange). The unit is in dollars per million BTU (Brithish Thermal Unit). The price of natural gas and oil have known for three years a strange divergence. 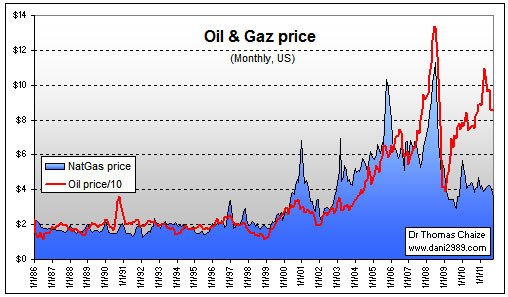 The price of oil has a high level while the price of natural gas is very low. If we divide the price of oil by natural gas prices we get a ratio. This ratio indicates that this divergence is rare because it must go back to the first two oil shock, 30 years ago, to find a similar situation. 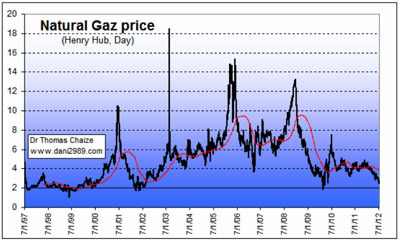 The price of natural gas dropped below $ 2.4, which is a major low point occurred only twice in 10 years. n the short term and a statistical point of view, the first quarter is the peak period for natural gas and the last quarter of the period for the high price of natural gas. Today, natural gas is temporarily in a situation of oversupply in North America with the growth of the production of shale gas (shale gas in French) and hydraulic fracturing. 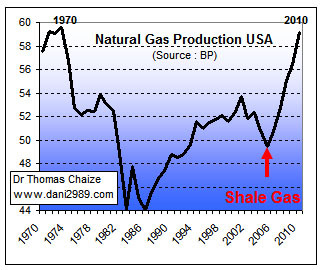 But gas production with hydraulic fracturing is more expensive than conventional gas production. The natural gas producers can not survive very long in the price of gas below 3-4 dollars. In the medium term, a $ 4-6 price seems a minimum necessary for gas producers to continue to produce natural gas in decent conditions. 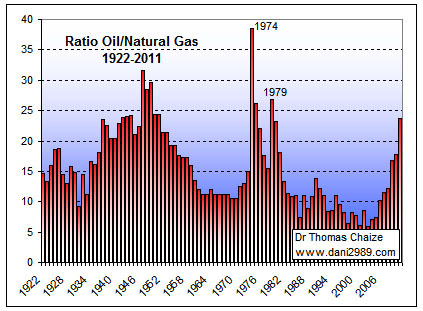 A very long term, with the growth of NGL production and peak oil, natural gas is destined for much higher price levels. Natural gas is the third largest source of energy used in the world after oil and coal. With the decline of uneducable conventional oil, natural gas and coal are logically the two energy sources for the future.